By now you are probably familiar with the cDataSets classes. Here is a straightforward implementation that provides a form you can use to select fields in a table to be copied to other sheets. It should demonstrate how versatile applications can be built in a very short time. Create a new sheet or copy data to an existing one. 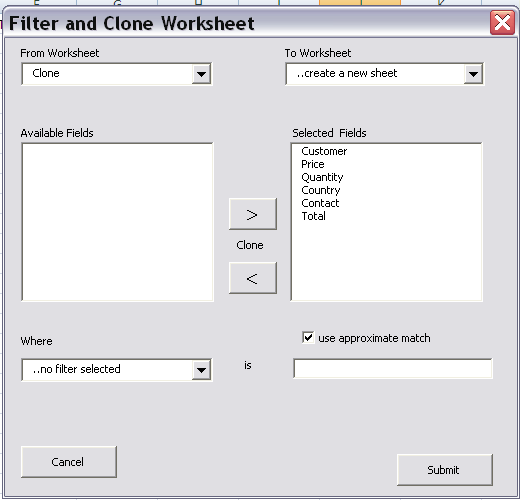 When a worksheet is selected, we clear the listboxes and filter fields, which are dependent on which worksheet is selected, and we create a new dataset based on the newly selected worksheet. Finding which column headings are present in the sheet then becomes a simple iteration through the .Headings property. By default these are all assumed to be fields to copy, so they are added to the selected listbox. The .populateData method is restricted to only read 1 row here, since we are only interested in the headings at this point and don't need to waste time reading the data. By default, all fields are in the right hand list box meaning that they will be copied from the old sheet to the new sheet. The < and > command buttons allow this behavior to be modified by moving fields between the 'available' and 'selected' listboxes. This is how to move selections between two listboxes that have been set to allow multiple selections. Finally this is what happens onSubmit. This time .populate data reads all the data in the input worksheet. The .bigCommit method has all the capabilities to copy from a data set to some other set of worksheet cells, and also knows how to apply the selected filter to only copy over qualifying records. The cDataSet class has many capabilities that enable the manipulation of spreadsheet data with minimal effort. As usual your comments , feedback and questions are welcome on our forum.